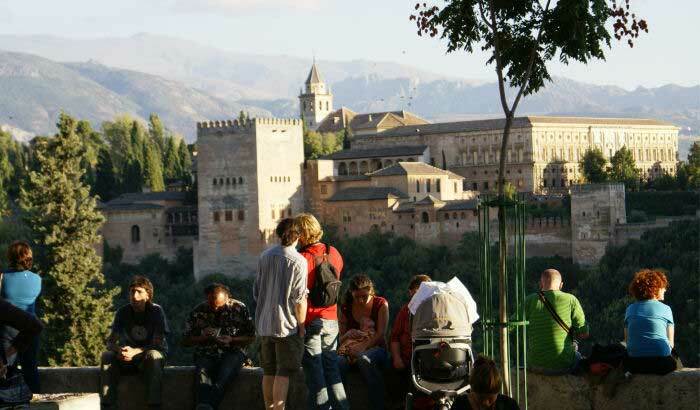 Except for the Alhambra itself the Mirador de San Nicolas is the biggest "must do" attractions in Granada. It is a square in the Albaicin which has the most wonderful view of the Alhambra and the Sierra Nevada. 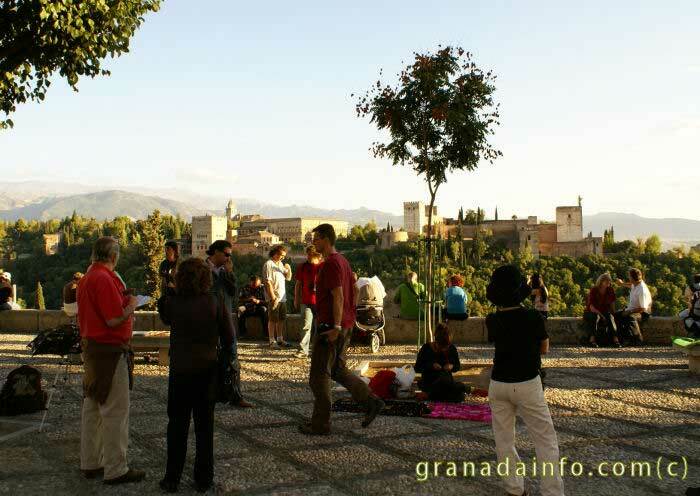 Almost every visitor to Granada will at some point have their photograph with the Alhambra in the background. Most people will spend at least 15 minutes here admiring the stunning view. There is normally a very pleasant very cosmopolitan atmosphere at the mirador. There is often a gypsy woman selling castanets and several people selling different kinds of handicrafts and jewelery. If you are lucky there will be some very good flamenco singing and guitar playing. How to get here The simplest way is to walk up. You can start walking up the Caldererias, go along to Paseo de los Tristes or walk up the Alhacaba then the Cuesta de la Lona. You have to be reasonably fit because it is an uphill walk of about 80 metres. Plaza Nueva is 690 metres and Mirador de San Nicolas is 769 metres. Otherwise you can get on a C1 or C2 minibus which does a loop of the Albacin. You can get on at Plaza Nueva or one of the bus stops on the Gran Via. Click here to see info about the buses. A taxi up from Plaza Nueva would be the minimum fare of about 4 euros. Eating: There are plenty of open air restaurants in this area. Just behind the mirador there are three bars. Bar Kiki is very good. In front of the Mirador there is a good restaurant and cafe bar with amazing views called Huerta de Juan Ranas. If you go down from the Mirador and then walk down the road in the same direction as the buses you will get to San Miguel Bajo which is a square with about 4 outside restaurants. Bar Lara is a good one. That is just a few ideas there are many more. this page shows many of the restaurants around a hotel that is near to the Mirador de San Nicolas. Walking: If you are not staying in the Albaicin you can get a bus back down to the centre. However, the Albayzin is a great place to wander around. Don't use a map. Just walk down in a random way through the cobblestoned streets. If you are lucky you might stumble upon a little bar serving cold beers. If you are feeling energetic you could walk up to San Miguel Alto which also has amazing views. Plaza Larga is worth a visit. We have an excellent walk which includes Mirador de San Nicolas click here You can even download the gpx file. Here is a video of the type of street Flamenco you can hear at Mirador de San Nicolas. His baby left him. She went. "se fue"